We welcome you to our new 1500 square foot home, located just 300 feet from one of the top 10 most beautiful beaches in the world. With 3 bedrooms, 2 baths, a full kitchen, washer and dryer, A/C, WIFI, Satellite TV, new appliances and furniture, plus many more amenities. We want you to feel comfortable and relaxed. The 10' x 50' deck with a gas grill is perfect for an afternoon filled with making great food and great memories. A beautiful view of the sunset will be a perfect ending to a perfect day. Treasure Cay's beach is 3.5 miles long with powdery white sand and warm turquoise blue water. It is only a 5 minute walk from our home. The 18 hole golf course is right around the corner. A morning of golf, a swim in the pool at the marina and lunch at the Coco Bar would be a perfect way to start your vacation. There are so many things to do while in Treasure Cay. Boat rentals are available for both experienced and novice boaters. 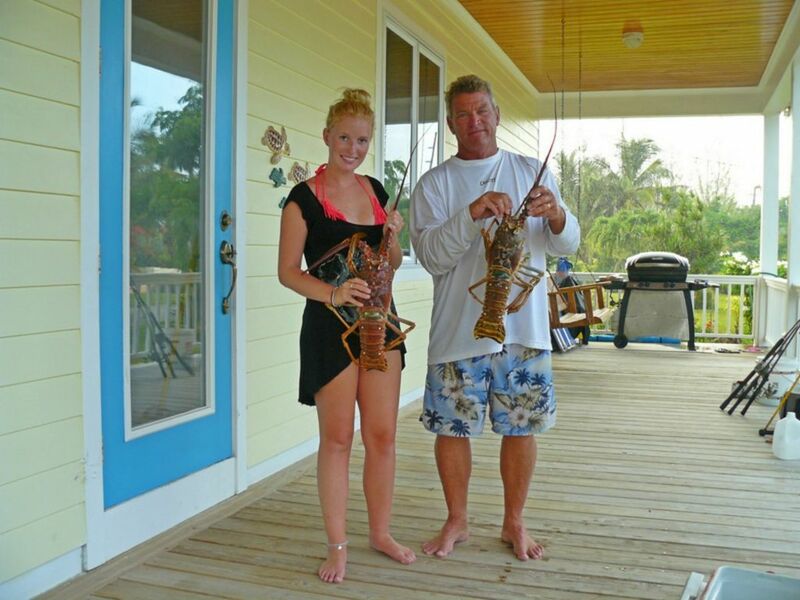 Treasure Cay has a 150 slip marina with your choice of charter fishing boats also. The Abaco Islands are protected by the open ocean by a string of cays with the opportunity to go snorkling,scuba diving, shelling, swimming, or just a quiet walk on many different private beaches. After a morning of snorkling and shelling you may want to go to one of many restaurants offered on most islands and have their 'specialty' drink and possibly some conch fritters and lobster quesadillas. There are so many places to explore. We decided to build our home in Treasure Cay because we loved the beautiful beaches, the friendly people, the ability to bring our boat from Florida. There are so many other Islands close by where we fish, snorkel and explore. We bring our daughter and usually a few of her friends. We both have very large families and they are able to come stay with us. Sue's favorite part is bringing our dogs and walking them on the beach everyday. We had vacationed here every summer for over 30 years and just fell in love with the Island. You will also!!! The most unique quality of Treasure Cay is the beautiful 3 mile beach. When you step on to the sand for the first time you will be amazed at how soft and white the sand is. Its so relaxing just sunning on the beach reading a book or just looking at the view of the surrounding Islands. The crystal blue water is typically very calm and clear. The Golf Course is just around the corner from our house. The Marina has a pool and a restaurant/bar and is really beautiful. We made sure our home is very relaxing with nice comfy furniture and soft sheets and towels. We have a really nice 50' deck in the front for watching the sunset and having a cool tropical drink. 200 Yards from the Sea of Abaco. Across street. Supplied with all of your cooking needs and nice dinnerware for entertaining. Everything in the kitchen is brand new. Satellite has music channels, lots of movies to choose from, all of the local channels from Florida. 50'x 10' wood deck with hanging chair, BBQ grill. Beautiful view. We provide beach chairs, beach umbrellas and beach towels. Everything was superb! Can’t wait to go back!!! If you’re looking to relax, Treasure Cay is the place! Casa Tortuga provided a great place to stay while on the island. We are a family of 6 and the house provided plenty of room. Andy and Sue are very attentive hosts and their home is wonderful! The beaches are some of the most beautiful we’ve seen. Turquoise water that’s crystal clear. Treasure Cay provides a place to get away from the hustle and bustle of real life. Sue provided knowledge of taxi service as well as things to do and places to go while on the island. The kids loved the golf carts rides to town, the cinnamon rolls from the bakery, ice cream from the Tipsy Seagull, and the breakfast sandwiches at the Tipsy Seagull. Don’t forget to have Jackie, the taxi driver, stop at Maxwells in Marsh Harbour to pick up groceries on the way in. He’ll also give you a tour of the island when you first get here! My kids loved the dogs that greeted us upon arrival and watched over us. They even hung at the beach with us all day one day!!! Overall, this was a great family vacation! We’ll miss the laid back island living, warm weather, salty air and friendly people of Treasure Cay! My family stayed at Casa Tortuga for our Spring Break and I cannot say enough good things about the house and the owners - Sue & Andy. The house is exactly as the photo and description appears. Very comfortable and everything you could want in a rental property. The location is great with a beach right across the street and a quick golf cart ride into Treasure Cay. We had a great time hanging out on the beach, fishing, swimming and eating! The owners were very helpful with any questions we had and had great suggestions on restaurants, groceries, golf cart rentals and boat charters. It was a fun and relaxing vacation! We will be back soon!! Thank you Tracey! I am so happy you all had a nice vacation! You really experienced the island. Thank you for your review! You are welcome to come back anytime. It was such a nice pleasure to have you. The house is beautiful and we were very comfortable – it really felt like our home away from home. We went bonefishing, scuba diving, ate way too much wonderful food, and lounged on pristine beaches, all while snow was falling at home (central PA). We could not have asked for a better spring break vacation! We can’t wait to come back next year, and we plan to stay longer. Thanks, Andy and Sue! Thank you Doug! I appreciate your review. I have your dates blocked for next year. A beautiful home that was well equipped! The owners have thought of every detail to make their guests welcome. and comfortable. The only request we would have for improvement is a new grill. We do plan on returning next year! Thank you Carolyn, I have already purchased a new grill! Thank you for your review. Casa Tortuga had everything we needed for an amazing vacation. Sue was so helpful and quick to answer any questions we had regarding the house. She also was helpful regarding what beaches were best for which activities. We Loved our vacation and look forward to coming back!! Boat rentals available nearby. Golf Course walking distance. Golf cart rentals available nearby for seeing Treasure Cay town.